Here are a few more photos from the Northeastern Poultry Congress. As you can tell, I’m rather intrigued with close-ups. My friend, Lauren Scheuer, was there with these delightful *handmade* “Lucy’s” Read her book Once Upon a Flock to discover who Lucy is. I now have my very own Lucy sitting on the mantle. Things have been busy lately, but I wanted to share some photos I took from the Northeastern Poultry Congress – which is essentially the Northeastern Westminster Dog show of chickens. If you’ve never been to a poultry show, do yourself a favor and check one out. You’ll you be amazed at all the different breeds, you’ll learn things about chickens, and you might even bump into a friend or two. The birds are kept in small cages during the show (which typically lasts a weekend.) They are viewed, judged, and winners are chosen. Although it’s easy to feel sorry for birds in stark cages, here’s the good thing about that situation – as anyone who has tried to take photos of chickens knows, it can be near impossible – chickens are constantly moving – when they are in a tight place, you’ve got a better chance for photos. Here are some of mine from the weekend. This egg is so fresh you can still see the bloom on it. Lesson 782 – The ongoing saga of whether it’s Mr. or Mrs. This is probably the biggest indicator for me of whether a chick is a male or female. The boys, at rest, tend to stand more upright with their chest thrust forward. The girls tend to be lower and more crouched. Do you see how the back slopes up? If you measured it, you’d find that the back slopes at a near 45 degree angle. And while we’re at it, let’s take one more look at that tail bling. Josephine, on the other hand’s back angle is not quite as severe. 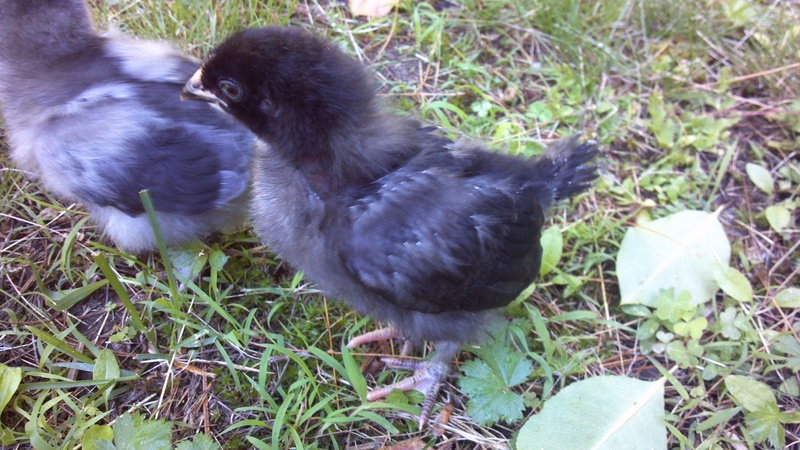 This morning I took the chicks outside for a little exercise. Josephine, on the other hand, horizontal and tucked in low, is pure female. A great afternoon for Em is done in three parts, 1. Shopping at thrift stores, 2. Having some Thai food, and 3. Spending time with the flock. And so this is exactly how we spent the afternoon. We took Mrs. Bucket and Josephine and put them on the lawn to get a few photos. Friday will go down in their little chick baby books as the day they discovered how fun and tasty ants can be. 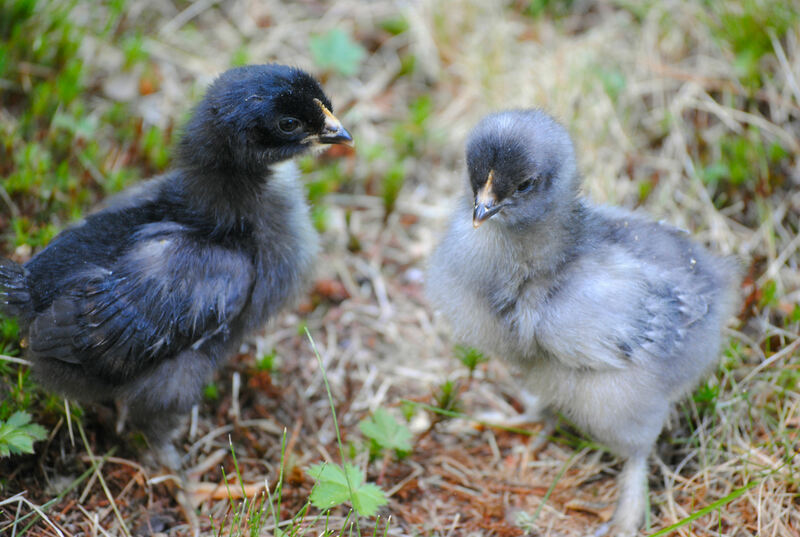 In playing with our new little Maran chicks, I discovered that our Blue Maran (Josephine) hadn’t completely absorbed her yolk sac before she was hatched. What resulted was a bit of an umbilical cord hanging out front. You can see the remains of her yolk on her stomach. 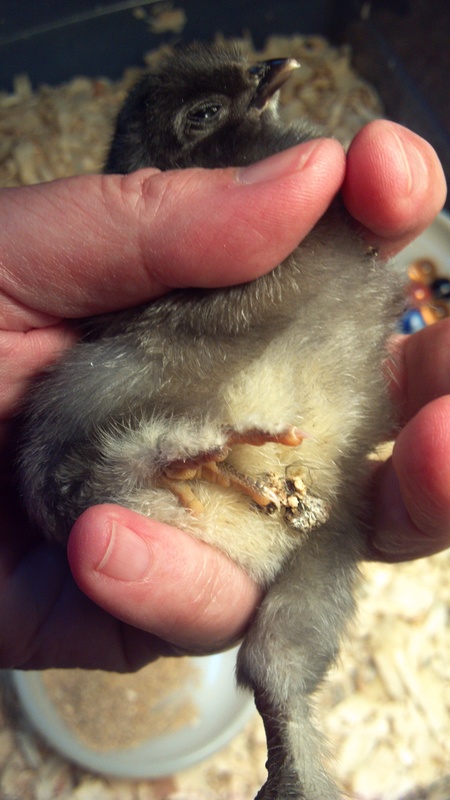 I had actually seen this before in another chick I had hatched in an incubator. 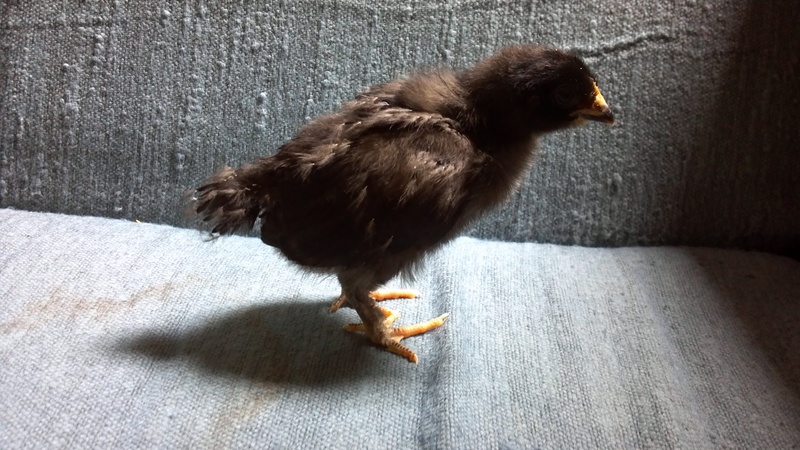 In that previous chick’s case, the *entire* yolk fell out (she was in every essence of the word a premie as I had to help her hatch out of the egg) and while she did recover, she only lived for a few months afterward being forever the smallest and weakest of our chickens. Josephine however seems to be holding her own. 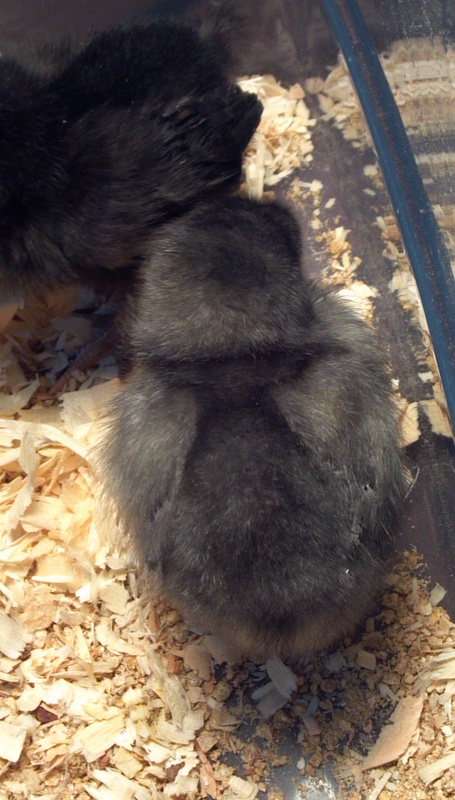 Although she is larger than Mrs. Bucket, she is far behind her sister (and I’m going with the assumption that both of the chicks are female) with regard to feather growth. And here is Josephine. For the most part, she is still all fluff. 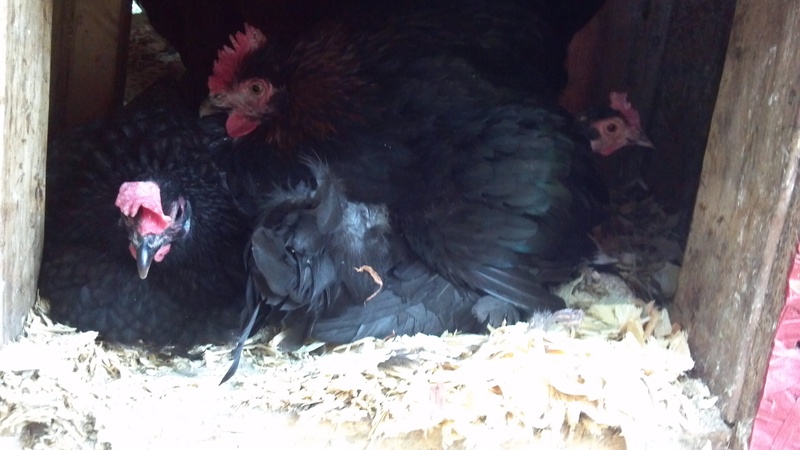 Both chicks are eating, drinking and are certainly active but Josephine seems to have a mild case of narcolepsy. She’ll be eating food and will fall asleep only to wake up when her head touches the ground, at which point she begins eating again. The first day when Addy was holding her, she noticed that if you put Josephine on her back in the palm of your hand, she immediately closed her eyes and went to sleep. It happened so consistently that we were thinking of booking her on a late night show for the “Dumb Pet Tricks” segment. Even now, when I wrap her in my hands and hold her under my neck softly clucking to her, between the warmth and the darkness, she’s out like a light. 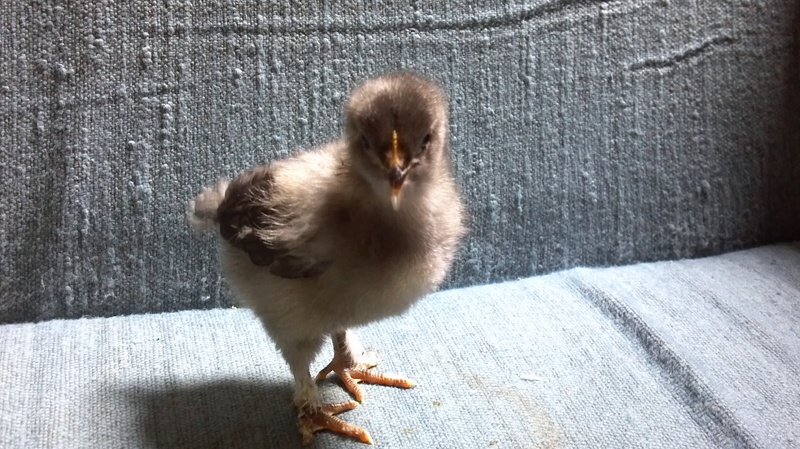 She’s a chicken-baby if I ever saw one. Josephine is not sick, wheezing, or sneezing. 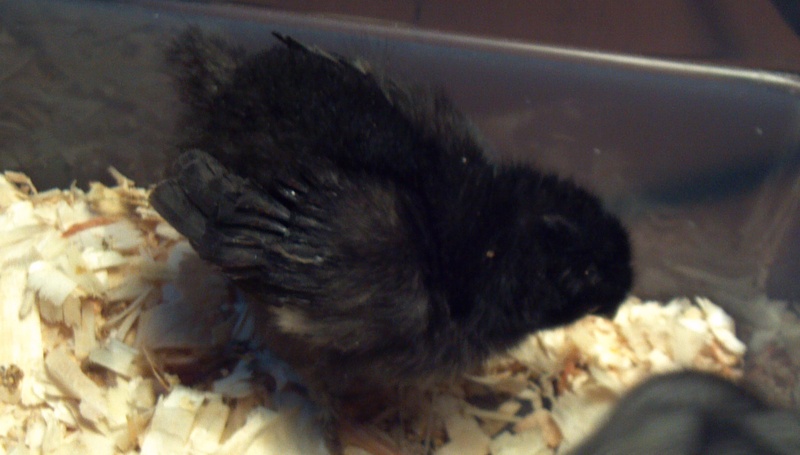 In fact, as I’ve pointed out, she’s even larger than her sister, it’s just that she’s a tired little chick who definitely needs her sleep. Today is cold and rainy in New Hampshire. Tomorrow should be sunny and warm, I’ll try to get a video of Josephine nodding off.